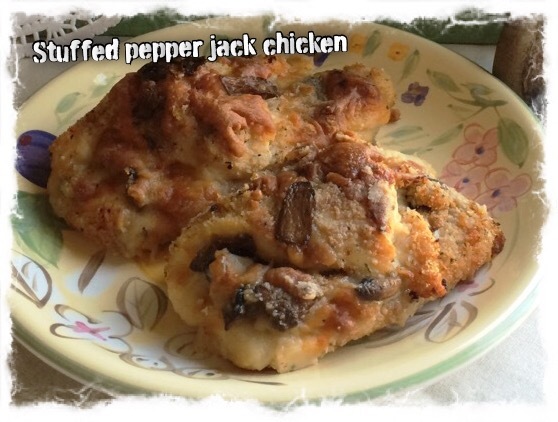 Tuesday I came home to a special treat after work, breaded & stuffed pepper jack chicken with fresh mushrooms. YUMMY!!! We have been remodeling our house since we moved in back in May, every chance we get. Hubby says “have to get it like we want it before we get to old”. My sweet husband stopped long enough to make some breaded & Stuffed Pepper Jack Chicken with sauté mushrooms. Now doesn’t that sound delicious, and make your mouth water? Well it was delicious, Mmmm good. I am sorry I didn’t get a better picture, I didn’t even think about getting a picture until we already ate dinner, so I snapped a quick shot so I could share this recipe with you. The last two pieces we took the next day to work for our lunches, and I must say it was as good as as it was the day before. Large boneless, skinless chicken breast cut in half and hammered to about ½” thick. Coat one side of your chicken with onion powder, garlic salt mixed in Progresso bread crumbs mix. Add some shredded pepper jack cheese, and a spoon of mushroom then roll your piece of chicken closed. Continue till you have all of your chicken pieces rolled and placed on a lightly greased baking dish. Sprinkle more pepper jack cheese on top, then spoon the rest of the mushrooms and juice on the top. Bake Stuffed Pepper Jack Chicken at 450 degrees for approximately 30 minutes, or until chicken is done. Serve with your favorite veggie and Enjoy!! !